What is the El Metro Real Time Bus Service? Finally an answer to the question… “Where’s my bus?” El Metro Real Time Bus Service uses GPS technology to track your bus and estimate when it will arrive at your stop. 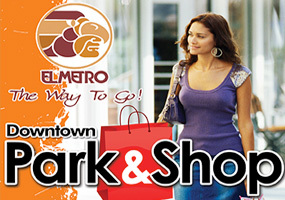 Web- you can use your desktop computer before you leave home or the office by to going to www.elmetrotransit.com. How do I begin to use the El Metro Real Time Bus Service? First, you need to identify the bus route number ex. Route 1 Santa Maria. If you are using our web page on your home computer, you can look up the route number under the route schedules icon. Can I get information on my smartphone or other mobile device? Yes, see instructions below for your mobile device. Route Display- The system can display various pages for routes as you need. The first page displayed shows all routes. You can choose between map and satellite view by clicking on the button. You can also zoom in and out and move to a different centering on the page by using the tool on the upper left. You may choose to select any or all routes by clicking on the “routes” button. This will allow you to view a simpler page will only the routes you are concerned with. The route will be displayed with an icon ( ) and will indicate the direction of the bus by the arrow within the pin. The routes will display red dots ( ) for the primary stops. If you click on the dot, it will then display the routes that travel through the stop and the scheduled time points. The stop window has a phone icon ( ) that if clicked on, will allow you to set up an alert that will send a message to you on a preplanned advance time, of the upcoming arrival of the bus to that stop. The instruction for the setup of the request will occur when you click on the phone icon. IVR=-The system has an Interactive Voice Response feature that will allow you to call on a telephone to a dedicated line; 956 795-2280, option 6 and the system will respond, ask you to select a route and it will then announce the next departure of that route for you. 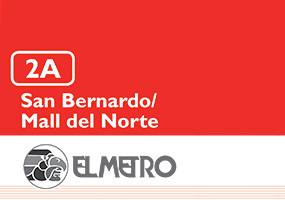 FAQ Are there fees for using El Metro Real Time Service? El Real Time Bus Service will not charge you in any way; however your carrier or internet provider may charge extra fee. Will the system work on a holiday? Yes, the bus times provided will reflect the holiday schedule, whether El Metro Real Time Bus Service is operating on a Saturday, Sunday or a modified holiday schedule. Does the system have alternative languages? El Metro Real Time Bus Service allows you to make inquiries in either English or Spanish. Are you tracking personal information about me? 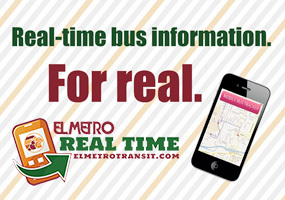 El Metro Real Time Bus Service does not keep track of your personal information.